Jason Absmeier, driving the #90 Revlimit Racing Mercedes-Benz AMG SLS, won his frantic battle with Sqaudro GhostworX’s Basheer Jawat to take victory of the first 2015.1 SA simGT Sprint Series race at the Nürburgring. 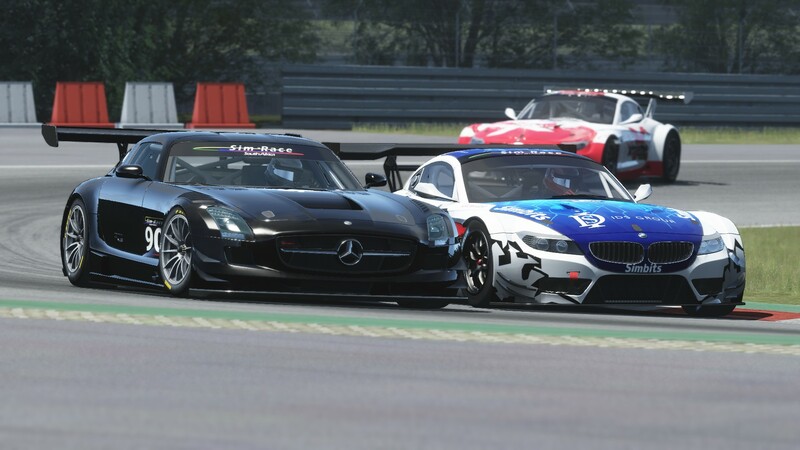 Jadwat maintained his front starting position to beat Absmeier into the opening corner, however just moments later Absmeier managed an overlap move on Jadwat to earn the inside line and the race lead at Turn 3 of the Mercedes-Benz Arena. Lap two saw the HRT inter-team fight between Chris Heyneke and Mark Henebury develop into a side by side sprint to the Veedol Chicane, Heyneke able to stay ahead during that specific attack. After closely following Absmeier for the first five laps and by using a better drive down the back straight, Jadwat passed Absmeier underbraking for the Veedol Chicane. The two front runners were ever wary of Boyd Bryson, in the #81 Xtreme Racing BMW, running very close behind in third position. Jadwat’s moment would not last long as an error saw his BMW fishtailing out of the Veedol Chicane to allow Absmeier just enough time to sneak past at the Coca-Cola Corner. For the remainder of the race, Absmeier manage to hold off repeated attacks from Jadwat to win race one. A solid drive by Bryson secured the final spot on the podium ahead of Jason Holden-Jones (#22 H-J Motorsport Mercedes-Benz AMG SLS). Henebury beat teammate Heyneke to fifth position. In the Drivers Championship, Jadwat now leads Bryson by 23 points with just one race to go. Squadro GhostworX did wrap up the Teams Championship at Mugello during Round 4.